One sire who captured the imagination of buyers during the three days of trade at Book 2 of the Tattersalls October Yearling Sale was Qatar Racing’s Hot Streak, whose highlights included a 220,000gns colt bought by Kingcraft Bloodstock. Hot Streak, a son of Iffraaj trained for the majority of his career by Kevin Ryan, was a four-time winner for Sheikh Fahad Al-Thani. His victories included the Group 2 Temple Stakes and the Group 3 Cornwallis Stakes, both five-furlong sprints. 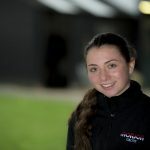 His first yearlings, who have gone through the ring this year, were bred off an opening fee of £7,000 in 2016 and the seven-year-old recorded excellent results at Tattersalls this week. Kingcraft Bloodstock also went to 200,000gns to secure another son of Hot Streak consigned by Whatton Manor Stud and Shadwell were among the purchasers of his stock when going to 200,000gns for a colt from the family of Footstepsinthesand and 150,000gns for a half-brother to useful sprinter Poyle Vinnie. Those results contributed to Hot Streak recording total sales of 882,000gns for seven lots sold, at an average of 126,000gns and median of 150,000gns. Established in 2016 by Adrian and Philippa O’Brien, Hazelwood Bloodstock enjoyed a superb result when their Kingman colt topped Book 2, selling to Stroud Coleman for 750,000gns. Out of the Listed-winning and UAE 1,000 Guineas runner-up Reem, the colt hails from the family of champion two- and three-year-old Rodrigo De Triano. That sale-topping sum was the second highest-priced lot to sell at Book 2 and it was a remarkable achievement for the O’Briens, as the Kingman colt was from the first group of yearlings they have taken from conception all the way through to the sales. They had another good result on the first day of Book 2 when their Kingman colt out of the winning and Group-placed Makfi mare Astrelle was bought by Tina Rau Bloodstock and RTC GmbH for 175,000gns. 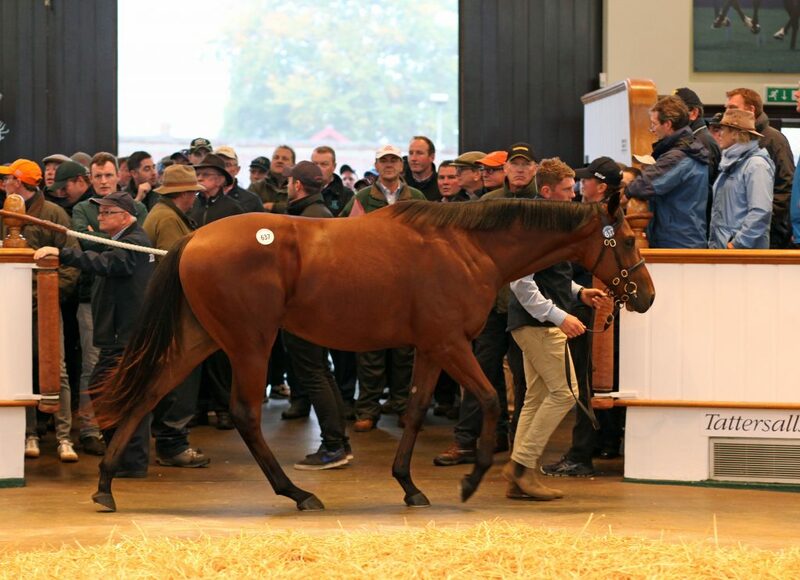 By the time the three-day sale was over, the operation had sold seven lots for a total of 1,081,000gns. Paul and Marie McCartan of Ballyphilip Stud in County Limerick, best known for breeding Group 1-winning sprinter Battaash, more than recouped the €40,000 outlay on their No Nay Never colt when he was snapped up by Alex Elliott for 450,000gns on Wednesday. Out of the unraced Fayruz mare Jacquelin Jag, a sister to Golden Jubilee Stakes hero Fayr Jag, it was Marie McCartan who had found the son of No Nay Never at last year’s Goffs November Foal Sale. 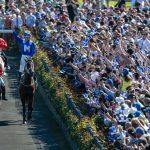 Elliott secured the colt on behalf of football agent and racehorse owner Kia Joorabchian, who races his horses under the Amo Racing Limited banner. His colours have been carried to victory this year by Lady Aria, Freebe Rocks and Flying Sparkle, all of whom are trained by Michael Bell. By the time Book 2 came to a close on Wednesday evening, 631 lots from 736 offered had sold for a total of 48,458,500gns, up just 1% on 2017’s total sales figure of 48,022,000gns. The median remained the same at 55,000gns and the average dropped 2% from 78,339gns to 76,796gns. Ballyhimikin Stud’s Kodiac colt was billed as one of the stars on offer during the first day of Book 3 of the Tattersalls October Yearling Sale and he certainly proved to be when selling for 135,000gns. Purchased by Margaret O’Toole, the colt was bred by Louise Quinn out of the Group 3-winning Sadler’s Wells mare Lucky, making him a half-brother to the winners Orewa and Chief Executive. Lucky is in turn a sister to 2,000 Guineas victor King Of Kings. The County Tipperary operation had earlier during Thursday’s session seen their colt, from the final crop of the much-missed Society Rock, sell for 100,000gns to agent Alex Elliott. That marked a profitable return on the 40,000gns paid through Anthony Stroud at last year’s Tattersalls December Foal Sale. Having produced some excellent results during the three days of Book 2, highlighted by their Dark Angel colt sold to SackvilleDonald for 420,000gns, Whatton Manor Stud were back on the mark on Thursday when selling a Champs Elysees colt for 90,000gns. The colt, who was bred by Ropsley Bloodstock and St Albans Bloodstock, had received a welcome update as his half-brother, the Simon Crisford-trained Sporting Chance, had won the Group 3 Prix Eclipse last month. 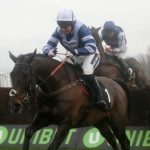 Charlie Johnston was among those to make a play for the colt but he eventually went the way of Kevin Ross, who bought the chestnut on behalf of Paul and Clare Rooney. While no lot broke the six-figure barrier on the final day of Book 3, the highlight came when a Zoffany filly offered by Voute Sales fetched 60,000gns from BBA Ireland. Bred by Fittocks Stud, she is out of the Listed-winning Bahri mare Cosmodrome and a half-sister to the winners Lovell and Snax. The further family includes the Group 1 winners Kitten and Ultra. 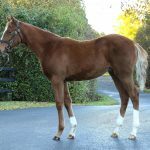 Richard Fitzsimmons of BBA Ireland who purchased the filly indicated that immediate plans could see the daughter of Zoffany re-sold at the breeze-up sales. Book 3 concluded on Friday evening with statistics that showed 472 horses from 587 offered changed hands for an aggregate of 7,590,800gns, a 3% decline on last year’s figure of 7,839,450gns. The median dropped 9% from 11,000gns to 10,000gns and the average fell 3% from 16,574gns to 16,082gns.